Congratulations to the winners of our 2017 End-of-the-Year Contest! One Grand Prize winner received all 40 of Carol Fitzgerald's Bookreporter.com Bets On picks from 2017, while eight others won a selection of five of these titles. You can see all the winners below, along with 2017's Bets On selections. Amber Patterson is tired of being a nobody. She deserves more --- a life of money and power like the one blond-haired, blue-eyed goddess Daphne Parrish takes for granted. To everyone in the exclusive town of Bishops Harbor, Connecticut, Daphne and her real-estate mogul husband, Jackson, are a couple straight out of a fairy tale. Amber uses Daphne’s compassion and caring to insinuate herself into the family’s life --- the first step in a meticulous scheme to undermine her. 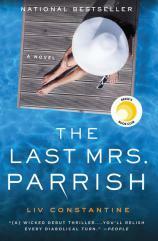 In THE LAST MRS. PARRISH by Liv Constantine (a pseudonym for the sister writing team of Lynne Constantine and Valerie Constantine), Daphne Parrish lives a fairy-tale life with a gorgeous home in Connecticut, a lake house, and a luxury lifestyle with her real estate mogul husband, Jackson, and two darling daughters. It’s the life that Amber Patterson wants.